Every woman has her version of the perfect man, and they are usually mute, with pecs the size of bowling balls. 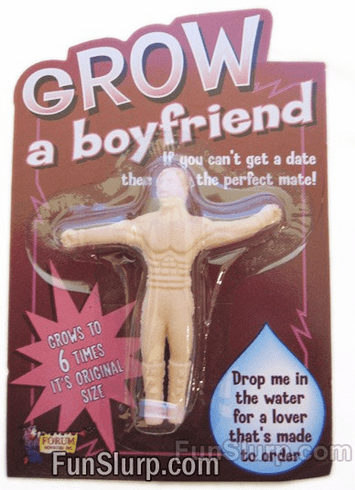 Why not use the Grow A Boyfriend to create the ideal man? The spongy dummy will grow to about six times its original size when placed in room tempurature water and then in a few days he'll be ready for a night on the town. He's a great listener, but don't expect him to pay for the check.